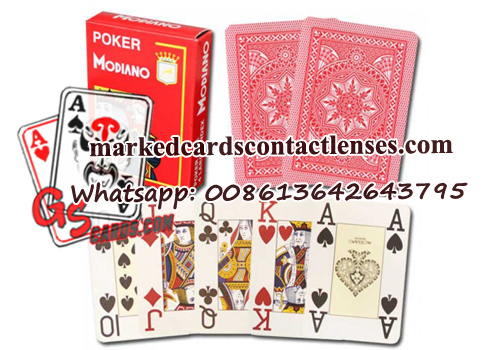 Modiano Cristallo 100% plastic playing cards manufactured in Italy by Modiano, these cards are wide, poker-sized at 2.5" by 3.5", and use a 4-pip jumbo index that provides unbeatable visibility when checking your hole cards in Texas Holdem. The Modiano Cristallo plastic cards has 8 colors, which will make your games more interesting. The Modiano Cristallo playing cards are 100% plastic cards, which can be used longer time than the paper cards.